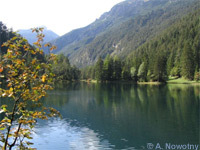 If you drive via the Fernpass on the way to South Tirol in Italy, passing the Blindsee about a mile after the actual mountain pass you'll reach the hotel "Schloss Fernstein", picturescly situated by a beautiful lake. Every time I came this way I thought about diving in the two lakes on the hotel grounds . Friends had told me about the outstanding visibility in those lakes, but I somehow hadn't yet managed to go diving there. This was partly due to the fact that day trips are not possible, as you have to stay at least for two nights in the hotel in order to get a diving permit. 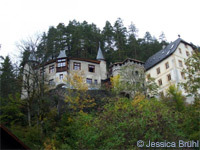 When I heard that the 10th meeting of the online Taucher.net community would take place at the Hotel "Schloss Fernstein", I immediately booked a place for myself. Unfortunately two days before the event unforeseen circumstances prevented my spending the whole weekend there. But due to the relative proximity of the location I managed to go there on the Saturday and at least get some value out of my booking. I got in the car and left Augsburg at the crack of dawn (actually even a bit before that) and drove through thick fog which only lifted once I got to the Austrian border. From there to the Fernstein pass the sun shone beautifully, only to turn into another pea souper. Great - once again typical Taucher.net meeting weather! The others were still at breakfast and I joined them to fortify myself for a day of diving and to catch up with old acquaintances. We put together the buddy teams and planned the dives of the day. Jessica (my favourite buddy), Dirk and I decided to try out Lake Fernstein before lunch and save Lake Sameranger for the afternoon in the hope that the fog might lift. A wise choice as it turned out! There are several entry points along the lakeshore. We drove along a small muddy path to one of them. As quite a few of their customers are divers with lots of equipment, the owners provide parking spaces and a little hut where you can change comfortably even if it rains. Very practical! The fog had lifted when we got there and it wasn't raining, so we didn't use the hut. I was hoping for a bit of sunshine as I wanted to take my camera with me. But instead of sun we got rain when we entered the water. 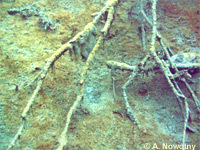 The lake's lack of nutrients results in stunted plant growth and a low number of fish. The greater part of the bottom of the lake is covered in slimy algae. During the dive I had the feeling of floating through a bizarre science fiction film set. We dove over barren red-brown hills, from which the odd branch or bolder protruded. We had just turned round to dive back to the entry point, when the clouds parted and rays of sunshine lit up the lake. The difference in atmosphere was astounding. The moving rays in the water gave the bizarre underwater world a very special touch. Taking a different route back, we came across a part of the lake with good plant growth and a biggish number of fish, which presented excellent photo opportunities for me. The fish were mostly trout looking for food. Back at the entry point we spent several minutes exploring this bit, as the sunshine had transformed it into the most fascinating part of our dive. 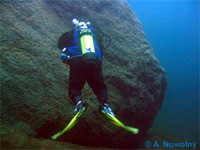 All in all the dive at Lake Fernstein was really great and fulfilled my expectations. Back on shore, Jessica, Dirk and I decided to have our lunch break here by the lake, enjoying the view of the Alpine panorama. Afterwards we made our way to Lake Sameranger for our second dive. You can find more scuba pictures from the dive in the Fernstein gallery.